You know the anger you feel when you pick up the phone and it’s a recording about an “amazing” cruise or that “limited time offer” for a “great” credit card rate? That’s how I feel when I get an unwanted email. I immediately open it and scroll to the bottom, looking for the unsubscribe link. In my zeal to unsubscribe to unnecessary emails, I’ve found that the UX of unsubscribing varies greatly. This piece will cover tips on designing for unsubscribe. Look, I get it. You need to promote your company, product, app, etc. And UX is about considering the user and the business. But when you either accidentally or willingly obfuscate the ability from someone to opt out of the stuff you’re selling, you aren’t providing quality UX. You’re promulgating dark patterns. And maybe your product, app, or company aren’t worth knowing about. Correction: if you build it right (and well) they will come. via GIPHY. I’m all for adding personality to your unsubscribe and having a consistent voice like that on your site—that’s just good content strategy. 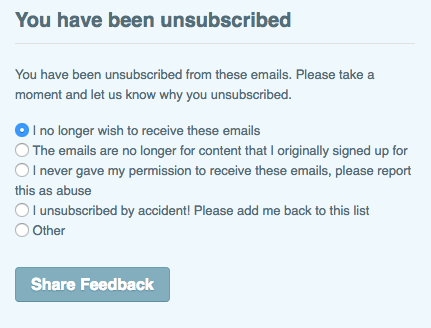 There are tons of fun unsubscribe pages. But, unlike some awesome 404 pages that help lessen the blow of going to a bad link, users have chosen to unsubscribe. Let them complete the transaction as you would have them do across your app. I love the unsubscribe option from Apple Mail, and there are apps to handle your unsubscribing needs. However, these exist as fixes to a problem that we shouldn’t have if we’re designing the right way. Let’s start with the email. I’m a user and I just got an email from SkeletorRulesHe-ManDrools.com. While I love Skeletor, I’m not down with the insults directed at He-Man, so I want to unsubscribe. Skeletor and his awesome evilness. via GIPHY. Let users actually unsubscribe. If you send out something soliciting or promoting a business or product and you don’t have an unsubscribe option it’s against the law. Also, people hate that. So don’t do that. Let users see that you can unsubscribe. Don’t overload the footer and have a small unsubscribe link in between your address and legalese. Be clear that it’s an unsubscribe link. Making it “Update” or “Edit” email preferences without an “Unsubscribe” isn’t clear enough. The unsubscribe link should be accessible. Don’t put the unsubscribe link in light gray against a gray background. This makes it so some people literally can’t see it. Just like your site, your emails should be accessible. Use a contrast checker site like this one. Give a link, not instructions. I recently received an unsolicited email with the text asking me to email them to unsubscribe—and include my email address in the subject line. This is obviously there to give extra steps to unsubscribe so that you won’t. Follow conventions. It’s fine to place an unsubscribe at the bottom of your email. Though I’m always impressed by those who place it more prominently and more than once. 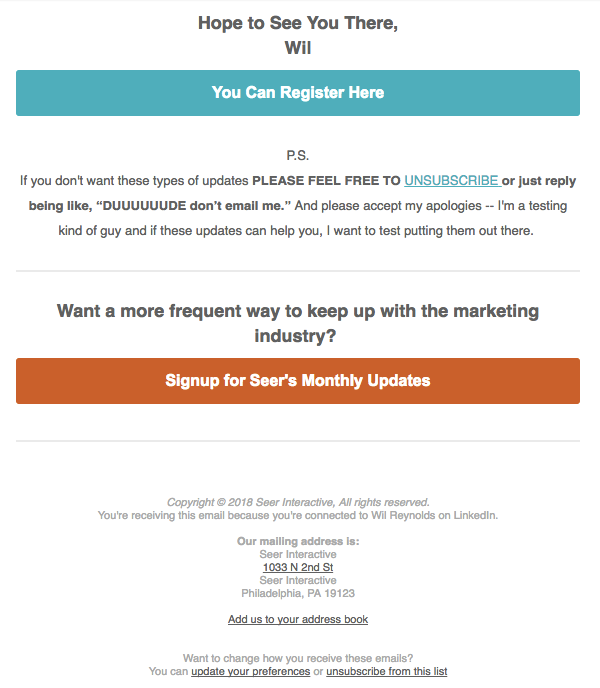 I was a huge fan of how this newsletter from a digital marketing agency gave three ways to unsubscribe: a prominent link in the email, ability to email (with a suggested witty response), and a conventional link at the bottom. When a user clicks unsubscribe, they’ll be directed to an unsubscribe page. Here are recommendations on how those should and should not work. It’s okay to collect data. Yes, you can and should collect data on why someone is unsubscribing. This data can drive change and possibly minimize unsubscribes. However, it doesn’t replace the need for user research. Yes, of course I meant to unsubscribe. No, a user didn’t unsubscribe by mistake. Please stop asking that. Sure, you should offer a “re-subscribe” on the page in the very small likelihood that users 1) found your small link at the bottom of the email and 2) selected it… by mistake. Make it real unsubscribe. 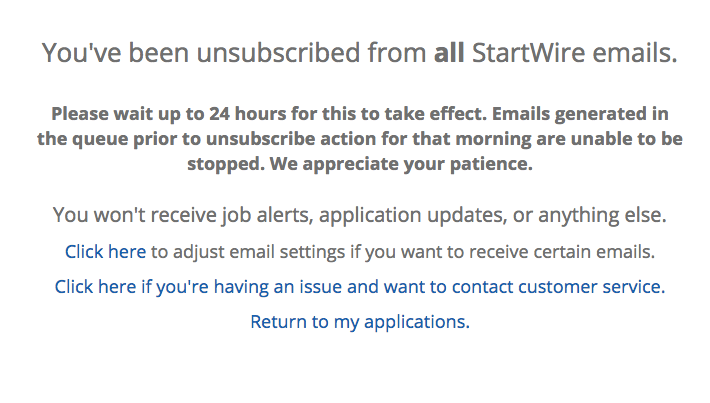 I recently tried to unsubscribe to a job alert email. When going to the unsubscribe page, the company didn’t actually let me unsubscribe. They let me put my request to unsubscribe on hold. 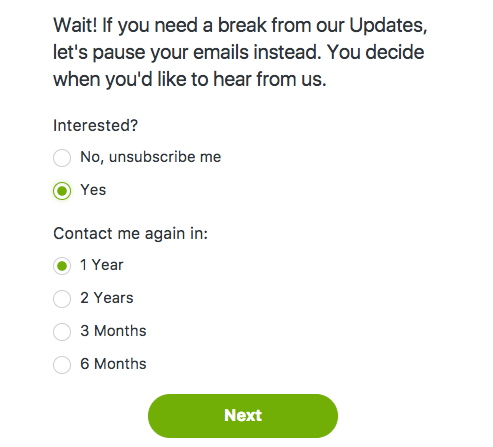 So, the default radio button is on “Yes”—which means I’m saying I’m interested in continuing to hear from them. Even when I selected “No,” it still required me to choose a time for them to contact again. I had to leave the unsubscribe page and go to notifications to truly unsubscribe. Let me unsubscribe without having to jump through hoops. Don’t make someone enter their email again. I’ve already clicked on unsubscribe. Just unsubscribe me without having to enter my email address. Confirmation emails are unnecessary. I just selected the unsubscribe link and possibly confirmed it on your unsubscribe page. I may have even told you why I unsubscribed. I’m done. And then you send me another email to confirm that you no longer are going to send me emails? This is a unnecessary transaction because you could have given a confirmation when I unsubscribed in the first place. Why are you still in my mailbox? Don’t be condescending. Finally, just because someone doesn’t want to get your emails that doesn’t mean you should be condescending. Don’t have unsubscribe confirmation pages that say things like “I am okay with not saving money!” or “I don’t like to learn.” Handle this breakup with some grace. They may even give you another chance one day. Accepting that some people don’t want to hear from us can be challenging. We put our heart and soul into what we design, and getting rejected is never fun. But that’s part of life in design—we need to ensure that we treat our users well when they enter our lives as well as when they leave them. 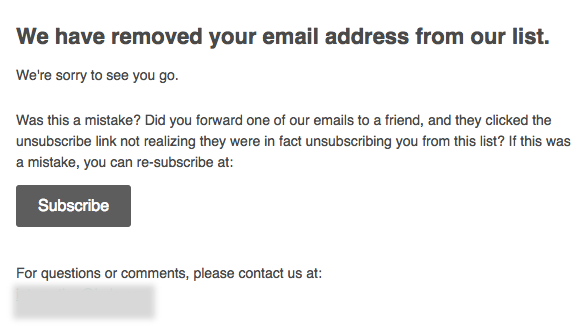 How do you design for unsubscribe? Do you agree with the best practices listed in this post? Tweet us @InVisionApp.